One-day trip to Kizhi island by hydrofoil is a wonderful opportunity to see all major sights of the famous open-air museum of wooden architecture and cultural history. 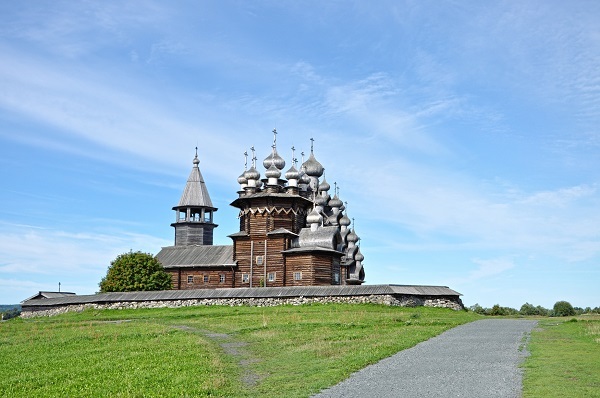 The core of the museum collection forms the world-known Kizhi Church Ensemble, a UNESCO World Heritage Site. If you come to Karelia just to visit Kizhi Island, this tour allows you to go to Kizhi without spending a night in Petrozavodsk. 11:15 Departure by hydrofoil to Kizhi Island (about 1h 20 min). 12:45 Excursion in the Kizhi State Open-Air Museum of Wooden Architecture. Visit of the Kizhi Pogost and the village. 16:45 Departure by hydrofoil to Petrozavodsk. See also our 2-day tours to Kizhi with accommodation close to Kizhi island.